This is a grab-bag of topics that cover the bits you probably wouldn’t use in day-to-day activities. Various options can be passed to Terminator at startup time to change numerous aspects and behaviour. I’ve rearranged and grouped the options compared to how they would appear using the -h option just to aid clarity. These settings are for people with heavy customisations to their window manager. Some window managers allow various rules to be applied, or actions to be taken, depending on how the window system perceives the window. These settings facilitate that. In case you’re looking for the previously supported classname setting, it has been removed as the gtk libraries deprecated the function call that allowed forcing the window class in this way. See Debugging for more explanation of these options. It is human readable, and can be edited if you are are careful. This is not generally recommended though, and you are, of course, strongly advised to make a backup before making manual changes. If you place items in the wrong location within the config file it can cause unintended results. In the worst case Terminator will fail to load. In the best case it will have no effect and you will simply confused as to why your change has made no difference. There is inbuilt debugging features in Terminator. 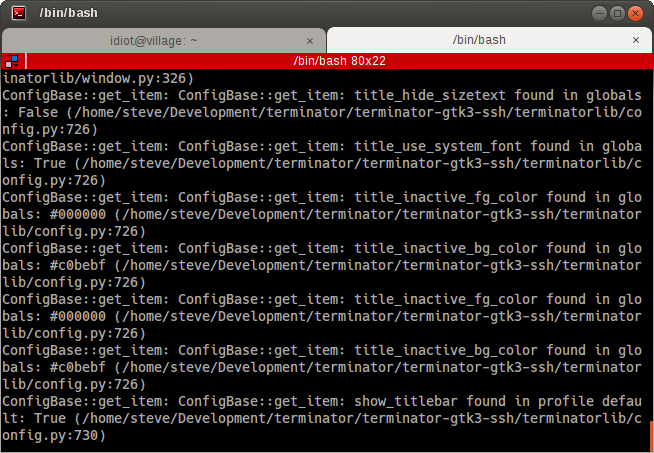 The simplest is to start Terminator from another terminal application (i.e. gnome-terminal) with the option -d. This will dump many debug statements to the launching terminal. If the DBus is active in any other Terminator, then by default your attempt to launch with debug will launch a new window under the already running process. To prevent this you can use the -u option which will disable the DBus interaction for the debugged instance of Terminator. There is a lot of output, and a great deal of it will typically not be related to the area you are looking into. There are two more options that can be passed that limit the amount of debug lines to classes or methods of interest. See Debugging options for the detail. The final facility is to start a debug server by passing -dd (this is the same as -d -d) which will start a debug server. With this setting a fourth item, Open Debug Tab, also appears in the second part of the The Context Menu, as highlighted in the image to the right. This prompt is a standard Python interactive prompt, but this is connected to the Terminator instance. You can explore the applications data structures, classes, etc. and can even call functions and methods. This should turn off the output, and let you explore the internal structure more easily. Using the -dd option will make the DBus interface temperamental. Any attempt to use Remotinator will hang the main application. The debug options and their usage are detailed here. DBus is a standardized form of IPC, or Inter-Process Communication. More detail about the internals of DBus can be found at the freedesktop.org for DBus. The first instance will create the server. The second instance will fail to create the server, so it will request the first instance to create a new window (or new tab with --new-tab). Running a single instance of Terminator can cause behaviour that is unexpected by the user when a terminator instance is already running. They do not have seperate processes, and currently some features (in particular broadcast, and grouping keys) may include more terminals than you expect. You can work around this by using the -u option that will disable the DBus for that secondary instance. The Layout Launcher already does this for you, and as a result any layout launched this way is running without DBus, and cannot be controlled with DBus. If you use the command line option -l <LAYOUT_NAME> to open a new layout, this will not disable the DBus unless you explicitly add the -u option too. There is quite some scope for improving this. I have a vague notion of a single master server and multiple instance servers, to improve the interaction between DBus and layouts. to force the UUID, or call it from outside Terminator. There are a couple of commands that do not require a UUID. Please see the table below for details. (1, 2) These commands do not require the UUID. If not marked as such then the command does require the UUID. Calling Remotinator without a command or with the -h will print the options and available commands to the terminal. If a layout has been launched using the The Layout Launcher or using the -u option Remotinator will not work with that layout as it is not connected to the DBus session. As mentioned in the DBus section, this has the potential to be improved upon. There is a lot of scope for expanding the available commands, and it is relatively simple to do, so is an ideal task for dipping ones toes.